The Society for Ecological Restoration defines "ecological restoration" as an "intentional activity that initiates or accelerates the recovery of an ecosystem with respect to its health, integrity and sustainability". 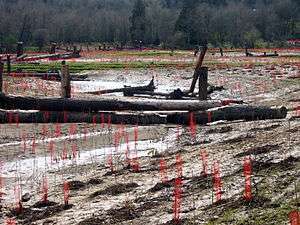 The practice of ecological restoration includes wide scope of projects such as erosion control, reforestation, usage of genetically local native species, removal of non-native species and weeds, revegetation of disturbed areas, daylighting streams, reintroduction of native species, as well as habitat and range improvement for targeted species. Restoration ecology is the scientific study of ecological restoration. Land managers, laypeople, and stewards have been practicing ecological restoration or ecological management for many hundreds, if not thousands of years, yet the scientific field of "restoration ecology" was not first formally identified and coined until the late 1980s, by John Aber and William Jordan when they were at the University of Wisconsin-Madison. They held the first international meetings on this topic in Madison during which attendees visited the University of Wisconsin's Arboretum—the oldest restoration ecology project made famous by Professor Aldo Leopold. The study of restoration ecology has only become a robust and independent scientific discipline over the last two decades, and the commercial applications of ecological restoration have tremendously increased in recent years. There is consensus in the scientific community that the current environmental degradation and destruction of many of the Earth's biota is considerable and is taking place on a "catastrophically short timescale". Estimates of the current extinction rate is 1000 to 10,000 times more than the normal rate. For many people biological diversity, (biodiversity) has an intrinsic value that humans have a responsibility towards other living things, and an obligation to future generations. On a more anthropocentric level, natural ecosystems provide human society with food, fuel and timber. Fundamentally, ecosystem services involve the purification of air and water, detoxification and decomposition of wastes, regulation of climate, regeneration of soil fertility and pollination of crops. Such processes have been estimated to be worth trillions of dollars annually. Habitat loss is the leading cause of both species extinctions and ecosystem service decline. The two ways to reverse this trend of habitat loss are conservation of currently viable habitat and restoration of degraded habitats. Restoration ecology may be viewed as a sub-discipline of conservation biology, the scientific study of how to protect and restore biodiversity, and restoration a part of the resulting conservation movement. The fundamental difference between restoration and other conservation efforts is analogous to the difference between disease prevention and treatment. Conservation attempts to maintain and protect existing habitat and biodiversity, whereas restoration attempts to reverse existing environmental degradation and population declines. Targeted human intervention is used to promote habitat, biodiversity recovery and associated gains. The possibility of restoration, however, does not provide an excuse for converting extremely valuable "pristine" habitat into other uses: as in medicine, it better to prevent than to treat. "Treatment" is generally less effective and more expensive than prevention, and "treatment" cannot always restore the condition before the "injury": some habitat and biodiversity losses are permanent. Though restoration ecologists and other conservation biologists generally agree that habitat is the most important locus of biodiversity protection, the disciplines themselves have different focuses. Conservation biology as an academic discipline is rooted in population biology. Because of that, it is generally organized at the genetic level, looking at specific species populations (i.e. endangered species). Restoration ecology is organized at the community level, looking at specific ecosystems. Because it is organized by species, conservation biology often emphasizes vertebrate animals because of their salience and popularity, whereas restoration ecology emphasizes plants because of their importance within ecosystems: ecosystem restoration is botanically based. Since soils define the foundation of any functional terrestrial system, restoration ecology's ecosystem-level focus also results in greater emphasis on the role of soil's physical and microbial processes. Conservation biology's focus on rare or endangered species limit the number of manipulative studies that can be performed. As a consequence, conservation studies tend to be descriptive, comparative and unreplicable. However, the highly manipulative nature of restoration ecology allows the researcher to test the hypotheses vigorously. Restorative activity often reflects an experimental test of what limits populations. Disturbance is a change of environmental conditions, which interferes with the functioning of a biological system. Disturbance, at a variety of spatial and temporal scales is a natural, and even essential, component of many communities. Humans have had limited "natural" impacts on ecosystems for as long as humans have existed, however, the severity and scope of our influences has accelerated in the last few centuries. Understanding and minimizing the differences between modern anthropogenic and "natural" disturbances is crucial to restoration ecology. For example, new forestry techniques that better imitate historical disturbances are now being implemented. Ecological succession is the process by which the component species of a community changes over time. Following a disturbance, an ecosystem generally progresses from a simple level of organization (i.e. few dominant species) to a more complex community (i.e. many interdependent species) over few generations. Depending on the severity of the disturbance, restoration often consists of initiating, assisting or accelerating ecological successional processes. In many ecosystems, communities tend to recover following mild to moderate natural and anthropogenic disturbances. Restoration in these systems involves hastening natural successional trajectories. However, a system that has experienced a more severe disturbance (i.e. physical or chemical alteration of the environment) may require intensive restorative efforts to recreate environmental conditions that favor natural successional processes. This ability to recover is called resilience. Habitat fragmentation is the emergence of spatial discontinuities in a biological system. Through land use changes (e.g. agriculture) and "natural" disturbance, ecosystems are broken up into smaller parts. Small fragments of habitat can support only small populations and small populations are more vulnerable to extinction. Furthermore, fragmenting ecosystems decreases interior habitat. Habitat along the edge of a fragment has a different range of environmental conditions and therefore supports different species than the interior. Fragmentation effectively reduces interior habitat and may lead to the extinction of those species which require interior habitat. Restorative projects can increase the effective size of a habitat by simply adding area or by planting habitat corridors that link and fill in the gap between two isolated fragments. Reversing the effects of fragmentation and increasing habitat connectivity are the central goals of restoration ecology. Ecosystem function describes the foundational processes of natural systems, including nutrient cycles and energy fluxes. These processes are the most basic and essential components of ecosystems. An understanding of the full complexity and intricacies of these cycles is necessary to address any ecological processes that may be degraded. A functional ecosystem, that is completely self-perpetuating (no management required), is the ultimate goal of restorative efforts. Since, these ecosystem functions are emergent properties of the system as a whole, monitoring and management are crucial for the long-term stability of an ecosystem. Restoration ecology, because of its highly physical nature, is an ideal testing ground for an emerging community's ecological principles (Bradshaw 1987). Likewise, there are emerging concepts of inventing new and successful restoration technologies, performance standards, time frames, local genetics, and society's relationship to restoration ecology, and new ethical and religious possibilities, as future topics of discussion and debate. Community assembly "is a framework that can unify virtually all of (community) ecology under a single conceptual umbrella". Community assembly theory attempts to explain the existence of environmentally similar sites with differing assemblages of species. It assumes that species have similar niche requirements, so that community formation is a product of random fluctuations from a common species pool. Essentially, if all species are fairly ecologically equivalent then random variation in colonization, migration and extinction rates between species, drive differences in species composition between sites with comparable environmental conditions. Multiple stable states is a specific theoretical concept, where all species have equal access to a community (i.e., equal dispersal potential) and differences between communities arise simply because of the timing of each species' colonization. These concepts are central to restoration ecology; restoring a community not only involves manipulating the timing and structure of the initial species composition, but also working towards a single desired stable state. In fact, a degraded ecosystem may be viewed as an alternative stable state under the altered environmental conditions. The ecology of ontogeny is the study of how ecological relationships change over the lifetime of an individual. Organisms require different environmental conditions during different stages of their life-cycle. For immobile organisms (e.g. plants), the conditions necessary for germination and establishment may be different from those of the adult stage. As an ecosystem is altered by anthropogenic processes the range of environmental variables may also be altered. A degraded ecosystem may not include the environmental conditions necessary for a particular stage of an organism's development. If a self-sustaining, functional ecosystem must contain environmental conditions for the perpetual reproduction of its species, restorative efforts must address the needs of organisms throughout their development. Spatial heterogeneity of resources can influence plant community composition, diversity and assembly trajectory. Baer et al. (2005) manipulated soil resource heterogeneity in a tallgrass prairie restoration project. They found increasing resource heterogeneity, which on its own was insufficient to insure species diversity in situations where one species may dominate across the range of resource levels. Their findings were consistent with the theory regarding the role of ecological filters on community assembly. The establishment of a single species, best adapted to the physical and biological conditions can play an inordinately important role in determining the community structure. "The dynamics of invasive species may depend on their abilities to compete for resources and exploit disturbances relative to the abilities of native species". Seabloom et al. (2003) tested this concept and its implications in a California grassland restoration context. They found that the native grass species were able to successfully compete with invasive exotics, therefore, the possibility exists of restoring an original native grassland ecosystem. Progress along a desired successional pathway may be difficult if multiple stable states exist. Looking over 40 years of wetland restoration data Klotzi and Gootjans (2001) argue that unexpected and undesired vegetation assemblies "may indicate that environmental conditions are not suitable for target communities". Succession may move in unpredicted directions, but constricting environmental conditions within a narrow range may rein in the possible successional trajectories and increase the likelihood of a desired outcome. According to the Society for Ecological Restoration, ecosystem restoration is the return of a damaged ecological system to a stable, healthy, and sustainable state, often together with associated ecosystem services. 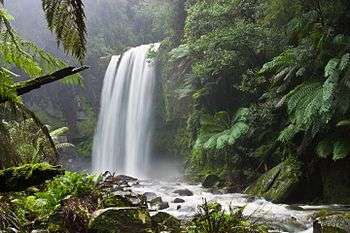 Restoring natural capital such as drinkable water or wildlife populations. Moral reasons: we have degraded, and in some cases destroyed, many ecosystems so it falls on us to 'fix' them. There are considerable differences of opinion in how to set restoration goals and how to define their success. Some urge active restoration (e.g. eradicating invasive animals to allow the native ones to survive) and others who believe that protected areas should have the bare minimum of human interference. Ecosystem restoration has generated controversy, with skeptics who doubt that the benefits justify the economic investment or who point to failed restoration projects and question the feasibility of restoration altogether. It can be difficult to set restoration goals, in part because, as Anthony Bradshaw claims, "ecosystems are not static, but in a state of dynamic equilibrium…. [with restoration] we aim [for a] moving target." Even though an ecosystem may not be returned to its original state, the functions of the ecosystem (especially ones that provide services to us) may be more valuable than its current configuration (Bradshaw 1987). 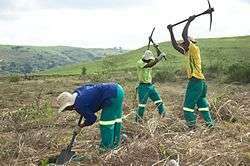 One reason to consider ecosystem restoration is to mitigate climate change through activities such as afforestation. Afforestation involves replanting forests, which remove carbon dioxide from the air. Carbon dioxide is a leading cause of global warming (Speth, 2005) and capturing it would help alleviate climate change. Another example of a common driver of restoration projects in the United States is the legal framework of the Clean Water Act, which often requires mitigation for damage inflicted on aquatic systems by development or other activities. Some view ecosystem restoration as impractical, in part because it sometimes fails. Hilderbrand et al. point out that many times uncertainty (about ecosystem functions, species relationships, and such) is not addressed, and that the time-scales set out for 'complete' restoration are unreasonably short. In other instances an ecosystem may be so degraded that abandonment (allowing an injured ecosystem to recover on its own) may be the wisest option (Holl, 2006). Local communities sometimes object to restorations that include the introduction of large predators or plants that require disturbance regimes such as regular fires (MacDonald et al. 2002). High economic costs can also be perceived as a negative impact of the restoration process. Public opinion is very important in the feasibility of a restoration; if the public believes that the costs of restoration outweigh the benefits they will not support it (MacDonald et al. 2002). In these cases people might be ready to leave the ecosystem to recover on its own, which can sometimes occur relatively quickly (Holl, 2006). Many failures have occurred in past restoration projects, many times because clear goals were not set out as the aim of the restoration. This may be because, as Peter Alpert says, "people may not [always] know how to manage natural systems effectively". Also many assumptions are made about myths of restoration such as the carbon copy, where a restoration plan, which worked in one area, is applied to another with the same results expected, but not realized (Hilderbrand et al. 2005). ↑ "Ecological Restoration". Retrieved 2013-10-04. Novacek, M.J. & Cleland, E.E. (2001). "The current biodiversity extinction event: Scenarios for mitigation and recovery". Proceeding of the National Academy of Science 98 (10), 5466-5470.